Uh-oh. 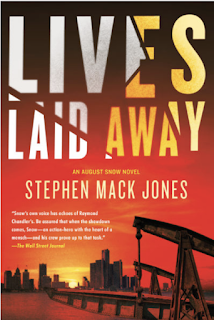 I just had to add Stephen Mack Jones to my list of "must read everything by this crime fiction author." The list is getting out of hand. That said, at least Jones has only one earlier mystery, August Snow (an award nominee), to round up for my new shelf space, in which LIVES LAID AWAY is getting great exposure. 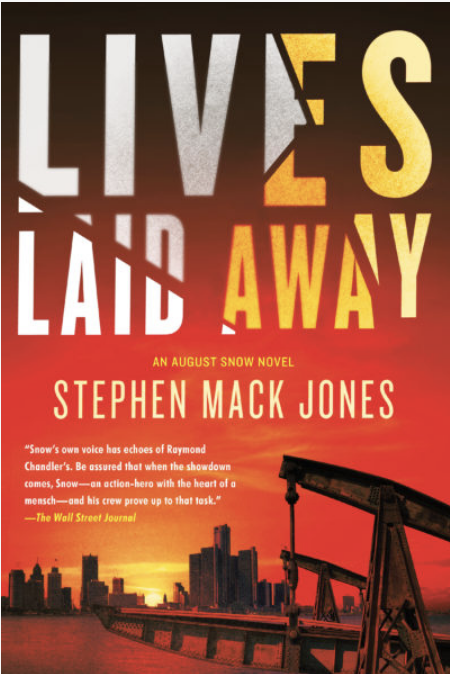 It's hard to believe this is only the second mystery from this author -- with a well tangled plot, excellent pacing, and the deft mixture of toughness and generosity in his protagonist, August Snow, this is a terrific new book and a great series. August Snow is an ex-police officer living in a rundown section of Detroit, determinedly saving his old neighborhood, one structure and worthwhile neighbor at a time. That means that when crime crosses his path, he's obligated to do something about it, unless he wants to lose what he's built. And he's still got some connections to work the case. Snow is as shocked as anyone else when the body of a young Hispanic immigrant turns up in the Detroit River, dressed in costume and clearly sexually abused. Snow's close friend Elena, who works with both legal and illegal immigrants to help them find their way to healthy American citizenship, can ID the young woman. And in that moment of recognition, she and August face a commitment to all the immigrants in the neighborhood whose persecution has become some criminal's new game. Of course, criminals aren't the only threat -- so is the law at times. "ICE agents were inquiring about Catalina," I said. "And Manny,"
"Jesus," Carlos said. Attempting to hold onto a thread of hope, he said, "Señora Elena's been looking into citizenship paths for--"
"Right now, my friend," I said, "there are no paths. Only landmines." "Is she -- are they safe? My boy? With Father Grabowski?" Carlos said I might as well have punched him in the gut. At least that would have left him with a bit of air in his lungs. I knew Detroit a bit, before its collapse. I wouldn't have wished this on any city. That said, the economic and social disaster of the city is forcing top crime fiction just as surely as sunshine forces a plant out of the earth. Count Stephen Mack Jones way onto the plus side of the ledger. A Soho Crime book, new in January.